On Wednesday, IDW Publishing released G.I. Joe Vol. 2 #1, the first in their new G.I. Joe line of comics and the second (kind of) part of the Cobra Civil War storyline. First off, the book is awesome. 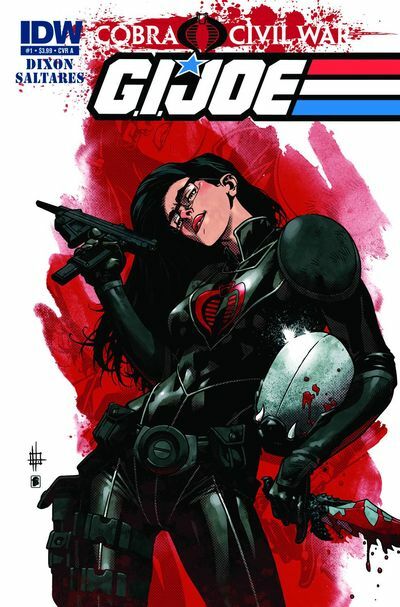 IDW made a wise decision in keeping writer Chuck Dixon on this title. Javier Saltares joins the team as a penciler, and although he's no Robert Atkins, he does an admirable job. It'll be interesting to see how he tackles the rest of the characters as they're unveiled. The story begins with Cobra's search for a new leader after Chuckles kills Cobra Commander. That's right, Chuckles. Without giving away any spoilers, this issue basically sets up the next chapter in the Joe vs. Cobra legend. From the look of things, it's going to be an exciting ride, and the bonus last page shocker is, well, shocking. The only complaint is that for a book sporting a G.I. Joe title, there weren't that many Joes in it, as most of the story revolved around Cobra. Hopefully the Joe team will have a more prominent presence in upcoming issues.